At Middlesex Door Systems, we provide owners of homes and buildings in the Burlington area with exceptional products and services. Our team of expert advisors will be happy to guide you through the process of purchasing a garage door system. In addition, our technicians are very proficient and the job is always well done. They have mastered every step of the installation and repair processes for any brand of garage door and garage door opener on the market. Be it for residential, commercial or industrial needs, we'll provide fast and friendly service. DO YOU HAVE A PROBLEM? We have the solution!. Provide emergency garage door services 24/7 (1-800-696-1926). Cover the residential, commercial and industrial sectors. Serve: Burlington, Lexington, Cambridge, Billerica, Bedford, Winchester, Woburn, Newton, Waltham, Reading, Stoneham, Belmont, Arlington, Lynnfield, Weston, Concord, Somerville, Gloucester, Manchester and surrounding areas. If your garage door comes equipped with a door opener, it is either a belt drive (wire-reinforced rubber) or a chain drive (similar to a bicycle chain). These two types of garage door openers work very well. However, the chain drive type requires a bit more maintenance since you have to lubricate the chain at least twice a year. 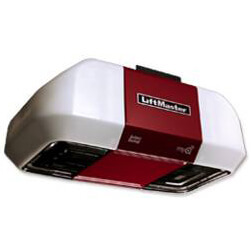 At Middlesex Door Systems, we have chosen to use the LiftMaster brand of garage door openers because they are reliable and offer excellent performance. 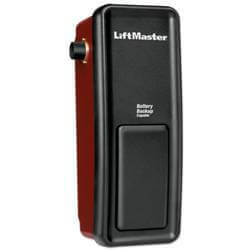 If, after a few years, a slight issue was to arise with your garage door opener, it would probably be caused by a misalignment or an obstruction of the photo-electric auto-reversing system or weak batteries in the door opener's radio transmitter. Don't worry. These problems are easily detected by our expert technicians. One of the most important characteristics for a garage door opener is its auto-reversing system when the door is closing. In case the door opener detects a person or object in the door's path, both safety mechanisms must always be in proper working order. The first is mechanical: if an object strikes the bottom of the door, then the door must automatically reverse. The second is photo-electric: if a person crosses the beam, then, again, the door must go back up. These two reversing mechanisms must be checked at least twice a year. Do not simply rely on the fact that you have a door opener to open and close your door. Be aware that while a door opener can easily lift 225 lb., it has to also lower these same 225 lb. Another example: in case of a power outage, if your garage door opener is not equipped with an emergency battery, you'll have to go in your garage to activate the emergency release mechanism (red cord) to be able to open and close your door. Therefore, this mechanism must always be in proper working order, so that it will be ready to use when you need it and avoid much hassle in case of an emergency. Call on Middlesex Door Systems for all your garage door and garage door opener needs in the Lexington, Winchester, Woburn and Burlington areas. Our team will be happy to come to your home to check your garage door system, identify the cause of the issue, and offer a speedy solution. We also offer a yearly tune-up program for your residential door or a yearly preventive maintenance program for your overhead doors, which includes a annual check of your garage door system to make sure it is always in proper working order. To book our maintenance or repair services, contact us immediately at 781-270-5066 or 1-800-696-1926.